This is my original Disney Planner for Walt Disney World and other attractions in Orlando. But I have a newer, updated version! I’ve got both versions below, so you can see which you prefer to download! The time had come for us to really start planning our Orlando, Florida Walt Disney World Vacation, and I needed a planner. 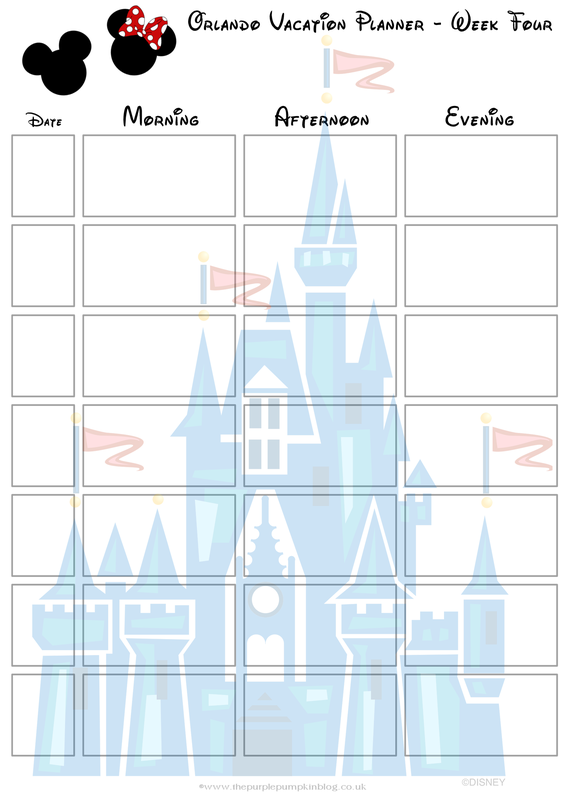 I couldn’t find anything I liked online, so I made my own Disney Planner! Planning and Disney go hand in hand because there is much to think about in advance like FastPass+ selections, Advance Dining Reservations, and Special Events like Mickey’s Not-So-Scary Halloween Party, or Mickey’s Very Merry Christmas Party, which are hard ticket events that are not included in your regular park tickets, but you have to buy separately. These events often sell out! You can also consult busy day guide for the parks can help maximise time in the theme parks, as well as check the Walt Disney World website for Extra Magic Hours if you are staying at a Walt Disney World Resort. The calendars are a week to view, with a space for you to write in your dates and space for morning, afternoon and evening planning. 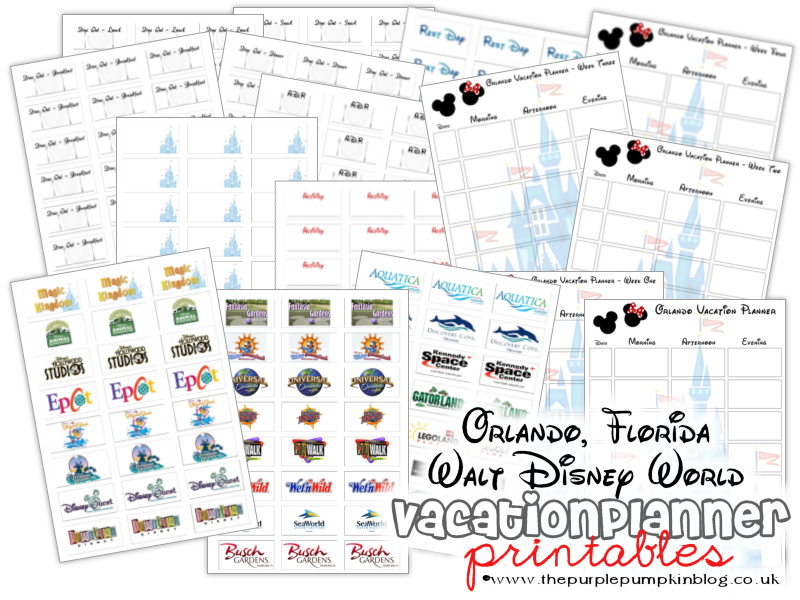 All you have to do is cut out the labels and start planning your Orlando, Walt Disney World Vacation! And once you’ve downloaded my Vacation Planner Printable, check out the other great Disney and Orlando tips and trip reports in my Disney Index! Version 2.1 of my Walt Disney World + Orlando Vacation planner is here! It is now a week to view with space to plan your whole day – morning, afternoon, and evening, as well as breakfast, lunch, and dinner plus, even more labels! Need more Disney? Make sure you check out #100DaysOfDisney! 100 days = 100 blog posts all about Disney and Walt Disney World in Orlando, Florida! Have your kids tried the Disney Magic Kingdoms Game yet? Do your kids love Peppa Pig as well as Disney? Check out my free party printables! As ever, I’ve got Pinterest Boards you can follow relating to this post! These are fantastic. I am just getting ready to start our itinerary and wanted to try to do something like this so you can move stuff around as things get worked out, not keep erasing. Thank you for sharing them. Thanks for joining the Travel Tip Thursday Blog Hop. Be sure to check back this week as your adorable printables are being featured! How awesome! thanks for featuring them – I’ll be sure to pop by again this week!